Risotto alla Milanese, which means ‘rice in the style of Milan‘ is one of the most famous dishes of the Northern Italian cuisine in the world. The main secret ingredient of this speciality is saffron that creates its vivid yellow colour and unique flavour. 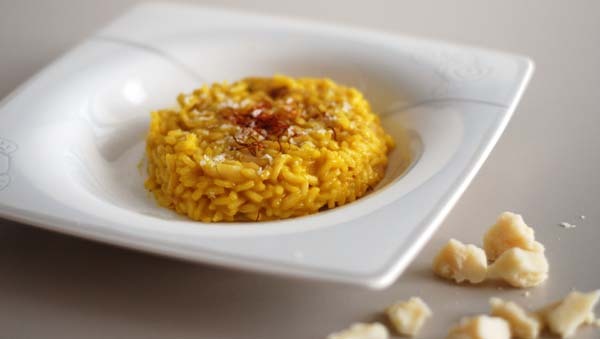 According to one of the legends about the history of Risotto Milanese, the idea of using saffron for a rice plate came to mind of an assistant of a famous painter Valerio di Fiandra in the middle of the XVIII century. When the painter was working on the great windows of the Milan Cathedral, known as Duomo, his assistant used to add a bit of saffron to the colours to make them appear more vivid. One day by mistake (or as a joke) the assistant added some saffron in a big pot where the rice for painter’s daughter wedding dinner was cooking. Surprisingly the dinner was not ruined, on the contrary, it was the day when a new milanese dish was born. Today you can find this yellow risotto in every Lombard restaraunt as a separate dish or as a side dish for ossobuco – another traditional dish made of veal shank slices with marrow bone in the center. You can easily make Risotto alla Milanese at home following our recipe. We offer you the original Italian version, but if you want to make your dish lighter you can use extra virgin olive oil instead of butter, and vegetable stock in place of meat stock. Step 1. First of all if you use saffron in threads, put them into a 1/2 cup of water for a few hours. If you use saffron powder you can use it straight away. Step 2. Prepare or heat the stock. Add salt if needed (usually you don’t add salt directly in risotto, only through the stock, so it should be salted enough) and keep it hot while you are cooking. Step 3. Heat 70 gr of butter in a saucepan over medium-high heat. Add minced onion and cook until it becomes translucent but not browned. Add the rice and cook until lightly toasted, about 4 minutes. Add wine and cook until it is evaporated, about 2 minutes. Step 4. Add 1/2 cup of hot stock and stir the rice. Now you can reduce the heat to medium-low and cover your pan. After 2-3 minutes, when the stock is absorbed, add more stock and stir again. Continue cooking adding the stock every 3-5 minutes. Wait until the liquid is absorbed before adding more! After about 13-15 minutes add the water with saffron threads (or saffron powder) and stir well. Continue cooking for a few minutes more according to the time indicated on the rice package (usually the total is about 15-17 minutes). Step 5. Turn off the heat, add the rest of butter and grated parmesan cheese. Your Milanese Risotto is ready!